Despite the big advances made on recent years, during the production process of LEDs, there are still some small variations that affect some of their features, optical as well as electrical. That’s the reason why LED manufacturers group the units according to their features, a process known as binning. This allows luminaries manufacturers to select the LEDs whose features are within an acceptable range. We must say that, even though the ideal, from a quality point of view, would consist of working with a unique bin as small as possible, the financial and logistical factors play also a relevant role. Thus, for instance, if a manufacturer accepts a wide variety of groups (bins) coming from his LED supplier, both the price and the delivery are considerably improved. Conversely, the variability of product features increase, a risk that can jeopardize the final result. 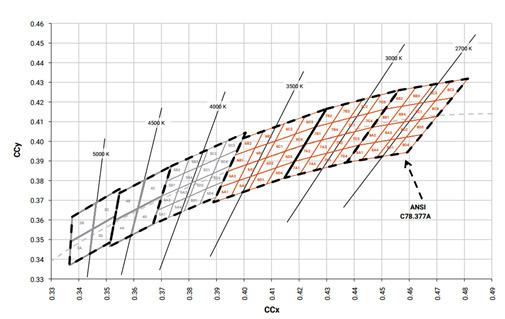 Among the used criterion to group LEDs, the amount of casted light and the color temperature are the most relevant. Concerning the first, the selection process is relatively simple: LED suppliers offer the information about the lumen range expected for each of their bins; this way, the luminaries manufacturer is able to choose the most suitable bin (or bin group) according to the needs of his product. Concerning color, it’s worth noticing that the process is a bit more complex: taking as a base the CIE1931 diagram (see figure 1), the manufacturer defines a series of quadrants that will correspond to each of his bins. The bigger the bin, the better the accepted color variation according to the standardized color temperature. Similarly, the smaller the bin, the better the color variation control. In 2008 was established the ANSI C78 37741 regulation, which defined the features of a number of standard bins. 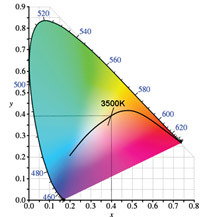 These defined the areas in which a light source must be enclosed in order to properly be considered of a specific color temperature. In fig. 2 we can see each of these bins, delimited by black dashed lines. However, we should say that, according to the ANSI standard, bins are fairly big: this explains the color differences, noticeable to the naked eye, among LEDs of the same group. That’s why manufacturers define smaller bins (the example on figure 2 would correspond to the regions shown in color) that allow them to have a more accurate control of variability. The metrics that we use to measure the variability of the MacAdam ellipse will be explained on our next post.